Help us celebrate Falls Prevention Awareness Week, September 22-28, 2013 by promoting this CDC evidence-based fall prevention toolkit with physicians across the state. 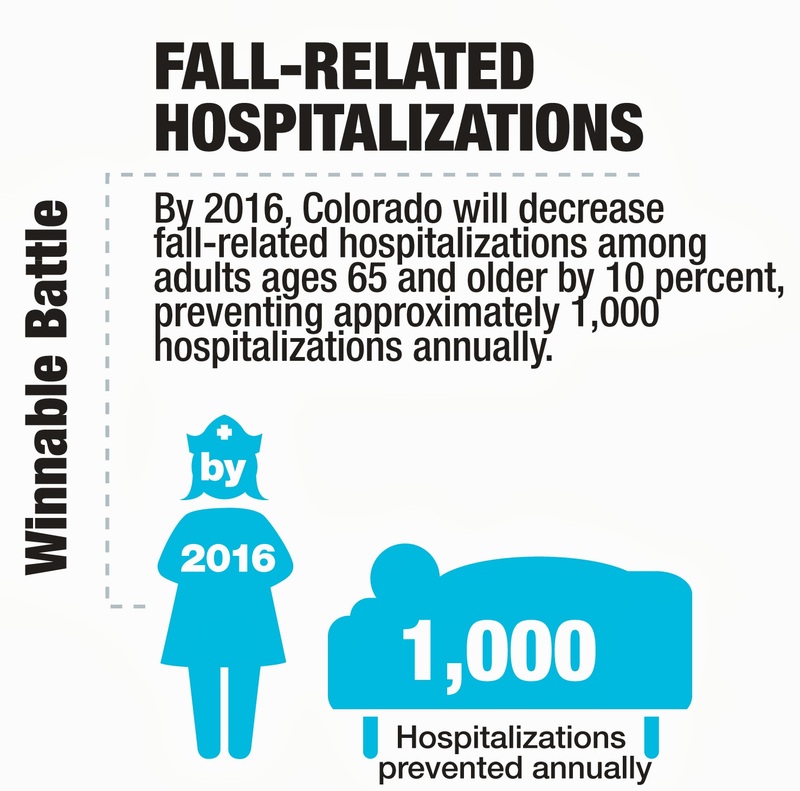 Injuries resulting from falls create a substantial health burden in Colorado, particularly for adults ages 65 and older. Each year, an average of 549 Coloradans ages 65+ die from a fall-related injury. Fall-related hospitalization costs alone total more than $263 million annually. The fear of falling is a real concern for older adults and can limit their interest and ability to be active in their homes and in the community. A majority of hospitalized fall victims are transferred to short-term care or skilled nursing facilities instead of returning to their homes. 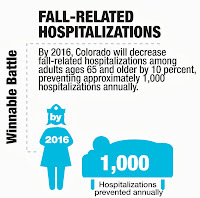 By promoting the implementation of evidenced-based fall prevention programs statewide, Colorado can decrease the rate of fall-related hospitalizations among older adults by 10 percent, preventing more than 10,000 hospitalized falls annually. Physicians play an important role in caring for older adults and reducing these devastating injuries. A study released in the New England Journal of Medicine saw a 10% reduction of older adult falls in targeted communities through the implementation of a multifaceted community based falls reduction program involving medical groups and the community. The STEADI (Stopping Elderly Accidents, Deaths & Injuries) Tool Kit, created by the CDC, is a multifaceted community based falls reduction program helping physicians assess fall risk and make referrals to physical therapy or community programs through the Fall Prevention Network or local Area Agencies on Aging. The STEADI Tool Kit contains resources and tools that will help make fall prevention an integral part of a physician's clinical practice. How can you learn more? Call Aerin LaCerte with the Colorado Department of Public Health and Environment to schedule a STEADI Tool Kit educational presentation or webinar: 303-692-2530 or Aerin.LaCerte@state.co.us. Generally speaking fitness enhances versatility and equalize by reinforcing muscles and additionally handy for cerebrum health. Being physically fit supports in your "driver fitness" too. You have to look after your physical and mental capacities so as to drive securely. In the event that you are fit, you can keep up your level of versatility either by strolling or driving, and remain animated and free. When you have surveyed you’re the earth, adjusted your surroundings to make it more secure, and created an arrangement to expand your fitness, you may need to think about your best alternatives for different types of portability. Is it true that you are still physically and rationally fit for driving securely or do you sense that your competency has "slipped"? One approach to measure this is to ask if you are restricting your life by constraining your driving. When you restrain your heading to just light hours, neighborhood ways, great climate, and so forth. You are finishing so out of expect that your capabilities are sort of bargained. Medicare Physical Template is a best way to get the better medication solution.